Hong Khaou has written and directed what has to be quite simply the most astonishingly beautiful piece of filmmaking I have seen in years. 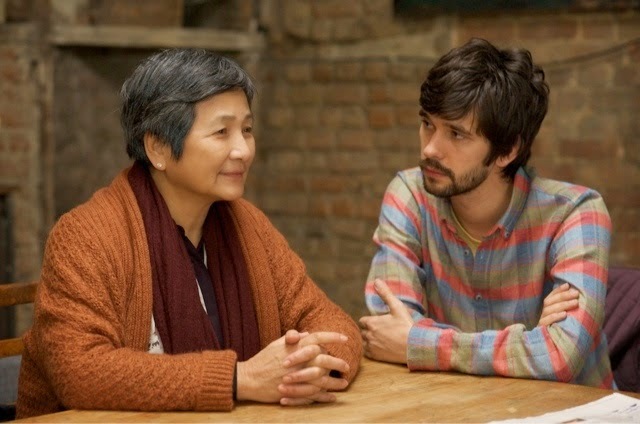 Lilting is a meticulously studied, meditative piece of cinema that examines the relationship between two very different characters, divided by culture and language but united in a shared grief. Cheng Pei-pei plays Junn, a Cambodian-Chinese woman who came to England with her husband to build a better life for her family. Now widowed and aging, her only son Kai has placed her temporarily in a well-meaning but suffocatingly old fashioned sheltered home, only to have his own life tragically cut short before his long term plans come to fruition. But Junn is not the only one mourning Kai’s death. Richard is Kai’s lover who has shared a home with him for four years, and his loss and devastation are deepened by the resentment that Junn holds for him. He is determined to make the peace with her but he speaks no Chinese and Junn no English, and besides, how can he make her understand when she never knew her son was gay? A strange and sometimes amusing new relationship between Junn and Alan, another resident at the home (a dapper Peter Bowles) serves as a plot device enabling Richard to employ Vann (Naomi Christie) as a translator, on the basis that she can help them get to know each other. Vann also builds tentative communication between Richard and Junn too, but with each pairing she occasionally slips out of direct translation and interjects with her own conversation, causing friction but ultimately helping to steer both relationships toward their logical conclusions. Throughout the film we keep encountering Kai (Andrew Leung) in scenes with his mother and with his partner - sometimes seeming as if memories, sometimes as imagined encounters - and some superb camera work and editing has him appear as illusory as the ghost that he has become. The two central performances of Junn and Richard are quite magnificent. Cheng Pei-pei has tremendous poise and dignity and her ability to have us understand every nuance of her character without a word of English is magical. Ben Whishaw (who I last saw on stage in Mojo last December) is outstanding in his characterisation. There is no other word but mesmerising for his presence on the screen, and his portrayal of a young man trying to hold everything together through a grief he can’t explain is absolutely heartbreaking. Key supporting performances from Andrew Leung and Naomi Christie are balanced well to the timeless quality of the story, while Peter Bowles is charmingly funny and a sometimes melancholy as the hapless love interest for Junn. Looking at this picture it is almost impossible to believe it was made on a budget of just £120,000. Cinematography by Urzula Pontikos is stunningly beautiful in understated low-key colour, complemented by Mark Towns masterful editing and a hypnotic score from Stuart Earl. There are not enough superlatives to express the heartfelt poignancy of this film and I cannot recommend it more highly. It has to be some sort of crime that Lilting is on only limited cinema release, as although it is also available on demand online it has to be seen on the big screen to make the most of it's finely crafted photography. Please try to see this at a cinema near you while you can.